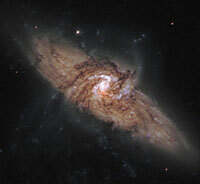 Galaxy NGC 4414 photographed in 1995 using the Hubble Space Telescope. Estimated distance from earth: 60 million light-years. 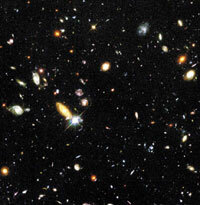 Hubble’s deepest-ever view of the universe. The image is said, by NASA, to offer a view ‘ … back to the beginning of time’, and offering ‘… important clues to the understanding of the evolution of the universe’. This picture covers a view of the sky about 1/30 the diameter of the full moon and represents a typical view of galaxies over the whole sky if we could see it. There are different models to explain how the light could have reached us in such a young universe,3 but the bottom line is as follows. If the evolutionary astronomer’s ‘big bang’ hypothesis is correct, then light from the most distant galaxies has taken the longest to reach us. Therefore, galaxies billions of light-years away would also be billions of years closer to the time of the proposed primordial ‘explosion’.4 Thus, since we are seeing these galaxies not as they are now, but as they were when the light left them, ‘big bang’ believers expect us to be observing them as being in much earlier stages of their alleged evolution than ones near to us. Galaxies are rotating, and the outer parts rotate more slowly than the inside. They commonly show a spiral structure, which is supposed to be the result of this rotation, starting from a simple bar structure. 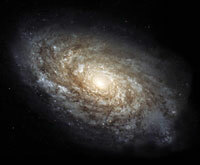 But this means that after a few rotations, galaxies will ‘wind themselves up’ so as to destroy the spiral structure. A unique galaxy pair known as NGC 3314, located about 140 million light-years from earth. In this alignment a face-on spiral galaxy lies exactly in front of another larger spiral galaxy. These recently-observed galaxies are ultra-young (according to ‘big bang’ belief) because they are so far away. So they should not have had time to develop even the beginnings of a spiral. The results seem consistent with the notion that the Lord, who spoke the stars into existence, made the galaxies much ‘as is’. He may well have had some unwound, some not and some fully, and the variety would ‘declare the glory of God’ (Psalm 19:1). In an instant, He spread out the heavens (Isaiah 48:13) and on Day 4 of Creation Week, just as He says in His Word, ‘He made the stars also’ (Gen. 1:16). Deepest Infrared view of the universe—VLT images progenitors of today’s large galaxies, ESO Press release 23/02, 11 December 2002, eso.org. Return to text. Since Einstein, one has to specify a frame of reference, as time has been shown to flow differently for different observers/locations. In particular, gravity slows time. So here the Earth is the reference frame. 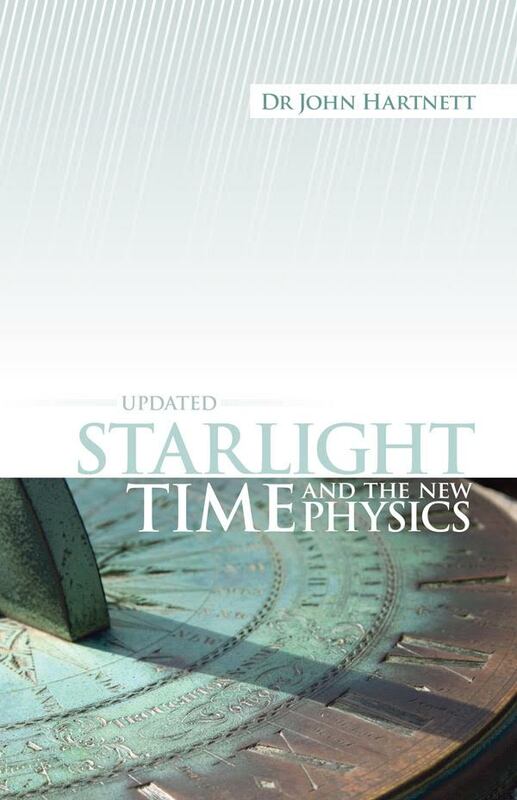 For further information, see Humphreys, R., Starlight and Time, Master Books, Arizona, 1994. Return to text. See Batten, D. (Ed. 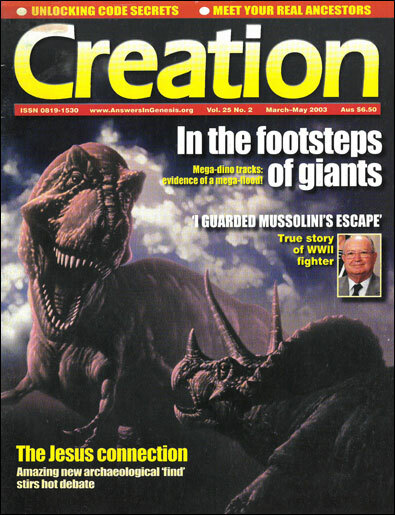 ), The Creation Answers Book, Creation Ministries International, Queensland, Australia, chapter 5, ‘How can we see distant stars in a young universe?’ 1999. Return to text. 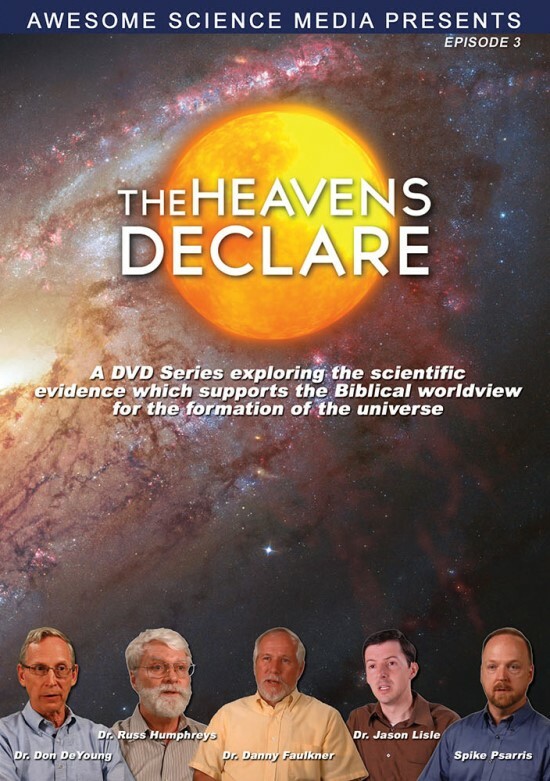 ‘Big bang’ cosmologists don’t conceive of this as an explosion in the usual sense, but as a rapid expansion of space itself from a point of infinite density. Return to text. Scheffler, H. and H. Elsasser, Physics of the galaxy and interstellar matter, Springer–Verlag, Berlin, pp. 352–353, 401–413, 1987. However, this postulates a complex theory of spiral density waves as a solution to the problem. But this is an ad hoc solution, i.e. there is no evidence for it, and it is an arbitrary assumption merely concocted to solve the problem, and requires much fine-tuning. Return to text. 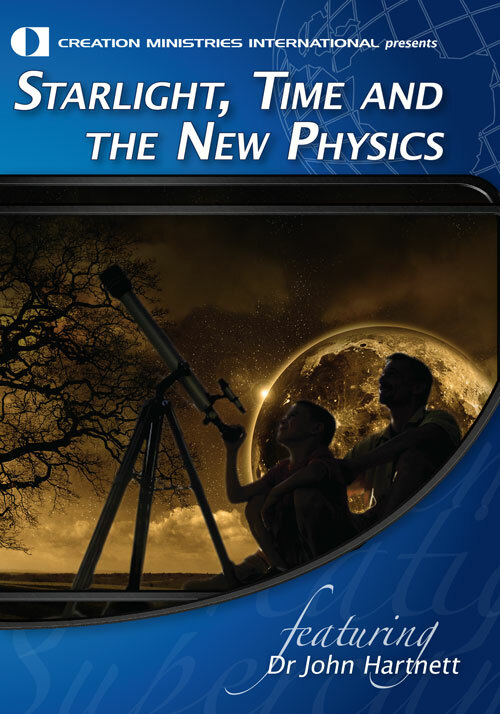 This is compatible with Humphreys’ time dilation ideas—see How do spiral galaxies and supernova remnants fit in with Dr Humphreys’ cosmological model? Return to text. When a light source is moving away from the observer, the lines are shifted towards the lower frequency (red) end of the spectrum, hence the term Red Shift. But for distant objects, the red shift is mainly caused by the expansion of space itself which carries these objects. The famous lawyer-turned-cosmologist Edwin Hubble (1889–1953), after whom the HST is named, discovered that distant objects had red shifts approximately proportional to distance from us. Therefore, according to ‘big bang’ dogma, objects with similar red shifts should have been formed at about the same time. Return to text.